UAMS faculty who worked on the award application include (from left): Kathryn Neill, Pharm.D. ; Susan Long, Ed.D. ; Wendy Ward, Ph.D.; Amber Teigen, M.M.Sc. ; Lisa Rhoden, M.Ed. ; and Cherika Robertson, M.Ed. Oct. 31, 2018 | Oct. 31, 2018 | On the strength of its interprofessional education curriculum, UAMS recently was identified as a Program of Merit by the Association of Schools of Allied Health Professions (ASAHP). 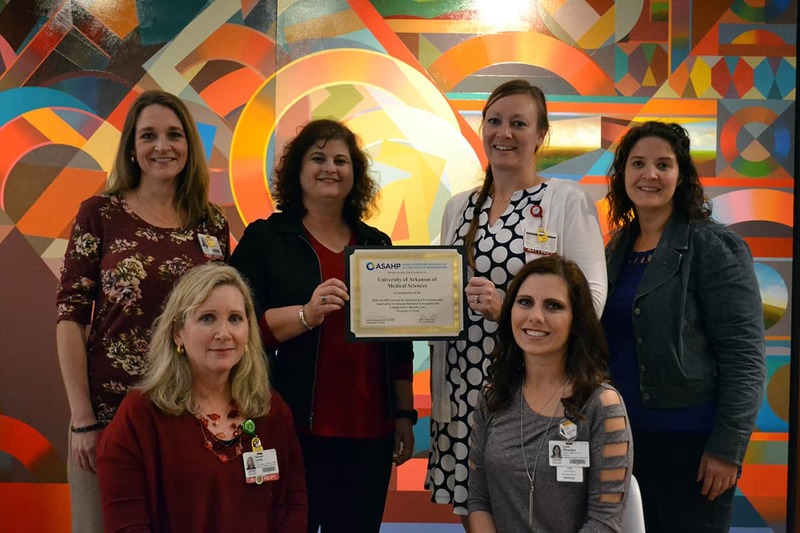 The award came as part of the association’s Award for Institutional Excellence and Innovation in Interprofessional Education and Collaborative Health Care contest. Since fall 2015, all UAMS students must complete 25 hours of interprofessional education activities to graduate.